The King Foundation and a collaborative of funders commissioned the Center for a New American Security (CNAS) to assess the needs of veterans in the region to assist in planning future philanthropic investment by the Foundation and its partners. This report summarizes research conducted by CNAS researchers between August 2015 and February 2016, using a mixed-methods approach that included qualitative research on regional trends; quantitative research using data made public by the Department of Veterans Affairs (VA), the Department of Defense (DOD), and other agencies; a targeted survey of veterans in the region; and discussion groups with participants representing more than 50 organizations that serve those veterans. 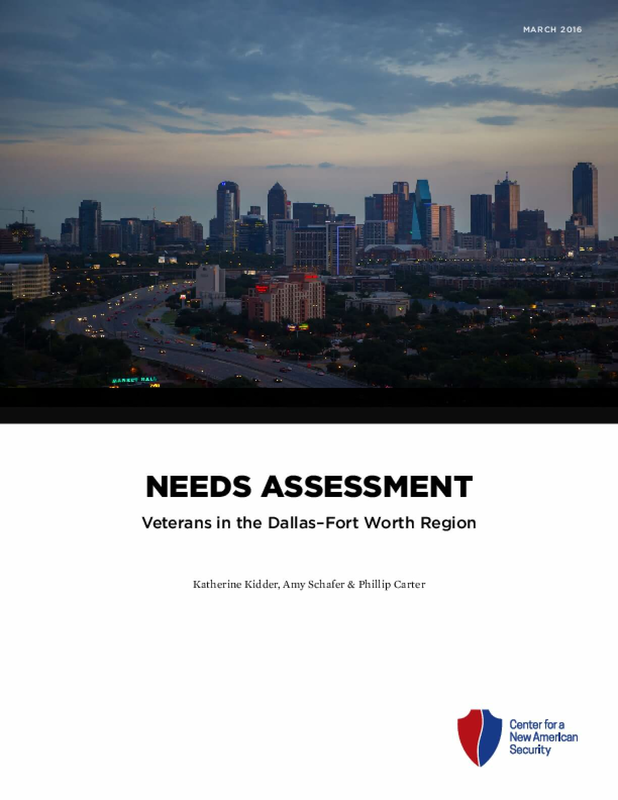 The following assessment attempts to answer the following research questions: What is the state of veterans in the DFW region? Where do needs exist among the DFW veteran population? How are the needs of veterans being met in the DFW region? What are the main efforts at meeting the needs of veterans? How does the coordination of existing services take place, and is there a collaborative structure in the region that guides investments, services, and the overall care? Copyright 2016 Center for a New American Security.